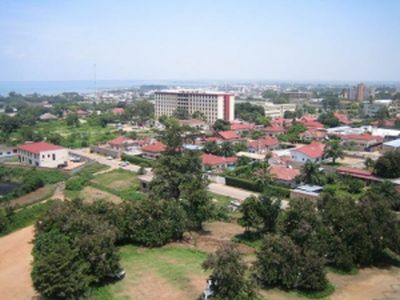 Bujumbura is Burundi’s capital and largest city. Located on the northeastern shore of Lake Tanganyika, it is only a few miles from the frontier with the Democratic Republic of the Congo by boat through Lake Tanganyika. Bujumbura grew from a small village after it became a military post during the German colonization of East Africa in 1899. After World War I, it was made the administrative center of the Belgian League of Nations mandate of Ruanda-Urundi, and was called Usumbura. The name was changed from Usumbura to Bujumbura when Burundi became independent in 1962. During the 1990s, the city was the scene of civil wars. For more than a decade, battles between Burundi’s two main ethnic groups (Hutus and Tutsis) have destroyed hospitals, administrative buildings, the University of Burundi, and other schools in the city. The wars crippled the city’s economy which has in turn had a devastating effect on the entire nation since Bujumbura is the main commercial center and includes both the central market place to the financial district. It is also the location of the country’s only port and main airport. The conflict ended in 2005 and Bujumbura’s most recent census (2012) estimates the population to one million. Despite its recent political and military turmoil, the city of Bujumbura remains vibrant. Its proximity to the beaches of Lake Tanganyika attracts tourists and it has long been considered one of East Africa’s best known cities for its night life and its ethnic restaurants which all varieties of food from traditional Burundian to French, Greek, Asian, Indian, Chinese, Lebanese, and Ethiopian. Bujumbura is also the center of beer manufacturing. Its two main brands Primus and Amstel are produced by Brarudi, the country’s only large-scale brewery. Numerous western philanthropist organizations maintain their headquarters in Bujumbura. The largest is the United Nations’ regional peacekeeping mission operations headquarters. Bujumbura is also headquarters of the city’s major religious groups. The Regina Mundi Cathedral is the administrative center of Burundi’s main Catholic Archdiocese. There is also a large Greek Orthodox Church for the followers of that faith. Le Centre Culturel Islamique in Bujumbura houses the Islamic Center and is the largest Muslim religious site in the city with less than 10% of population practicing the Islamic faith. Since Burundi is mostly Catholic, other religions such as Protestants represent 5-10%, while others such as the Greek Orthodox have no significant number of followers. The Prince Louis Rwagasore Mausoleum and the National independence Monument are also found in Bujumbura.